It is not easy taking photo of Matthew. He doesn’t smile nor pose for the camera. 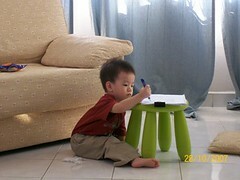 He was busy scribbling in the living room. I quickly took out my camera to snap this photo without his knowledge. Does he looked serious or what?